Watching the snow fall outside (again) this morning, we’re reminded of an important HVAC-related safety tip, which is to keep your gas furnace vents free of snow blockages. 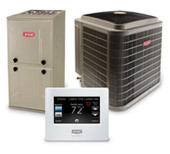 Besides impacting the performance of your HVAC system, this could end up saving your life. First of all, the most important thing you can do is ensure your home has working Carbon Monoxide (CO) detectors. If you love family, then do this now. Follow these directions on where to place your Carbon Monoxide alarms in your home. 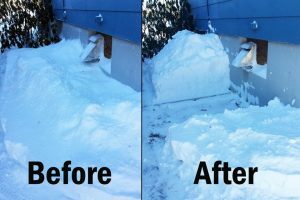 When you get back from Home Depot, we can discuss keeping your furnace vents clear! Your gas furnace needs an intake vent to draw oxygen into the unit, and an exhaust vent to expel the Carbon Monoxide created to heat your home. Even a partial blockage to either one of your furnace vents can affect the performance. This post is not about furnace performance; it’s about the perils of a blocked furnace exhaust vent, which can allow dangerous CO to build up in your home. If you don’t know about the dangers of Carbon Monoxide, then we’re not impressed – please start Googling. Another key area to watch for snow and ice build-up is on your actual gas meter. You may think that Enbridge is asking you to keep it clear of snow so they can read it and bill you accordingly, because that’s true – but a key part of this is avoiding the associated dangers. For example, excessive ice build-up can cause piping to come detached, leading to a gas leak. Keeping it clear and visible makes it accessible if emergency service is needed, and reduces the risk that a snow plow might impact the unit (especially important for units that are adjacent to a driveway or alleyway). This is not rocket science. Keeping your heating vents and gas meter free of snow and ice is a simple and smart thing to do. It may also save your life one day.